Beattie emulated his father, also John, when he made his first Scotland appearance in the 48-6 victory against Romania at Murrayfield in November 2006. The pair, both back-row forwards, were the fourteenth father and son to play for Scotland, and the then 20-year-old Johnnie marked his debut by scoring the first of the seven tries in 48-6 victory. His second cap a week after the first was not so memorable for him as he was carried off with a leg injury only six minutes into the international against the Pacific Islanders. He returned to the national colours three months later in the A international victory against the Italians at McDiarmid Park, Perth, and he was back in the Scotland XV to make his Six Nations Championship debut in the 2007 tournament's final match against France in Paris. He returned to Scotland A action in starting in all three Churchill Cup matches in England in May and June 2007 but missed out on selection for the 2007 Rugby World Cup. He reclaimed his place for the first of Scotland's two Tests on the visit to Argentina in June 2008. 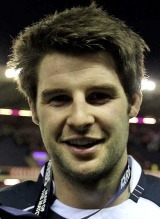 He cemented his place in the international set-up during the 2009 end of year internationals and was an ever-present during the 2010 Six Nations - John claiming the man-of-the-match honour in Scotland's 15-all draw with England at Murrayfield and followed that by scoring his third try for Scotland, a magnificent score, in the away victory against Ireland. He was again present for the historic Test series victory over Argentina later in the year but surgery on a shoulder injury in the summer of 2010 would sideline him for six months. His return to action was a drawn out affair and he made just one appearance during the 2011 Six Nations. Beattie joined Glasgow on an apprentice contract in summer 2004 and made his first competitive start for the team in the Celtic League match against Ospreys at Swansea in October that year. In season 2005-2006 he became a mainstay of the Warriors team and earned a call-up as injury cover for the senior Scotland tour in South Africa before joining the Scotland under-21 team for the world championship in France.